Porto Alegre ( [ˈpoɾtu aˈlɛɡɾi]; Joyful Harbor) is the capital and largest city of the Brazilian state of Rio Grande do Sul. Founded in 1769 by Manuel Sepúlveda, its population of 1,481,019 inhabitants (2016) makes it the tenth most populous city in the country and the centre of Brazil's fifth largest metropolitan area, with 4,405,760 inhabitants (2010). The city is the southernmost capital city of a Brazilian state. The city lies on the eastern bank of the Guaíba River (also referred to as a lake), where five rivers converge to form the Lagoa dos Patos (Lagoon of the Ducks), a giant freshwater lagoon navigable by even the largest of ships. This five-river junction has become an important alluvial port as well as a chief industrial and commercial center of Brazil. 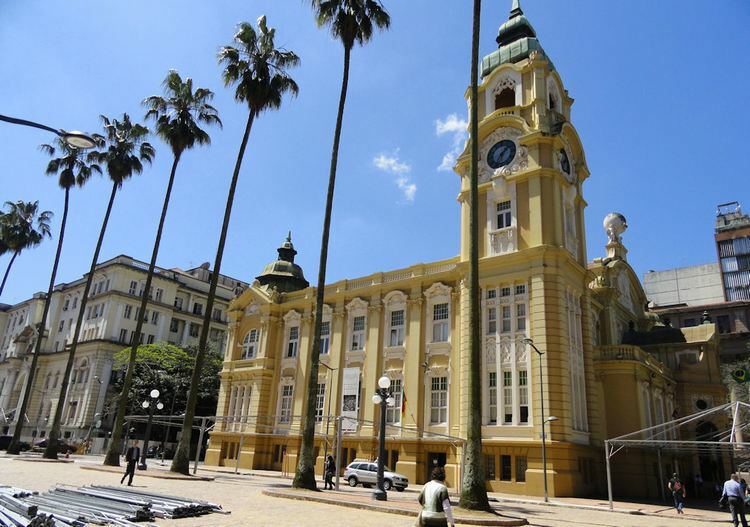 The capital city of Rio Grande do Sul is also the capital city of the Pampas region, the name given to the region of fauna and flora typical of the vast plains that dominate the landscape of the South of Brazil, part of Argentina and Uruguay. This is where the Gaúcho comes from, the historical figure of a brave warrior that fought legendary battles and wars in the quest to conquer the borders of the Kingdoms of Portugal and Spain in the 16th century. The city is on a delta resulting from the junction of five rivers, officially called Guaíba Lake (popularly mentioned as a river, too). Although its origins date from the mid-18th century, when immigrants from the Azores settled in the area, the city was officially established in 1742. Porto Alegre is one of the wealthiest cities in Latin America and one of the most diverse. It has welcomed immigrants from all over the world, the largest numbers coming from Portugal, Germany, Italy, Spain and Poland. There are also significant Arab and Jewish contingents among its population. The Afro-Brazilian population of the state is concentrated in the city. Before this, Porto Alegre was the port of Viamão on the shore of Guaíba Lake. Its previous name was Porto dos Casais (Port of the Couples), and it was initially settled by Azorians. Many families of settlers came from the city of Rio Grande in the littoral Lagunar region, to the south, a military fortress at that time. Today Rio Grande is the most important port of the State of Rio Grande do Sul. The city is also known as "Porto do Sol" (Port of the Sun) and "Cidade Sorriso" (Smile City). More than 70 neighborhoods (see below) are part of the city and two-thirds of the population are concentrated in the Zona Norte (Northern Zone), where most of the economic activity, including the city center, takes place. Porto Alegre was the seat of the World Social Forum in 2001, 2002, 2003, 2005 and 2010. As the second largest city in southern Brazil, it is an important industrial center in the area. It is also a center for gaúcho (the popular name for natives of the state) history and culture, famous for its churrasco (barbecue) and chimarrão (a strong and hot tea prepared from erva mate). Important Brazilian universities, such as Universidade Federal do Rio Grande do Sul (UFRGS), Universidade Federal de Ciências da Saúde de Porto Alegre (UFCSPA) and Pontifícia Universidade Católica do Rio Grande do Sul (PUCRS) are there. In 2000, the literacy rate was 97%. The high quality of life is one of the city's main features. Porto Alegre is located in the subtropical zone and thus features a humid subtropical climate (Cfa in Köppen climate classification). Average precipitation is high and regular throughout the year. Summer temperatures often rise above 32 °C (90 °F) and high levels of humidity make the season very muggy. Subtropical climate is a climate zone characterized by hot, humid summers and mild winters. Significant amounts of precipitation occur in all seasons in most areas. Most summer rainfall occurs during thunderstorms and an occasional tropical storm. The winter is mild, windy, rainy and quite changeable, which is also a feature of this time of the year. Usual winter temperatures range from 10 °C (50 °F) to 19 °C (66 °F). In the coldest days of the year the temperature may fall slightly below zero, like in 2012, when it recorded −3 °C (27 °F) (according to AccuWeather; unofficial). Snow is very rare, sometimes confused with sleet. The only snowfall events in Porto Alegre were in 1879, 1910, 1984, 1994, 2000 and 2006, albeit few of them with accumulation. Fall tends to be as changeable as winter, but is typically warmer. Spring, stabler akin to summer, is slightly drier than all the other seasons. Occurrence of radiation fog is common, causing several delays in early flights. Unlike other large Brazilian cities much farther north, notably Brasília, São Paulo, and Rio de Janeiro who observe a pronounced summer maximum in precipitation amounts, the city of Porto Alegre experiences a prominent winter maximum in precipitation values and cloud cover, for the summer season is primarily hot and dry; though evidently high humidity levels often give a distinct mugginess to the air and negatively impacts air quality. Annually Porto Alegre receives an average-total precipitation amount of 1,348 millimetres (53.1 in). This average makes the city slightly wetter than Rio at 1,172 millimetres (46.1 in) yet, to a considerable extent, drier than both São Paulo at 1,457 millimetres (57.4 in) and Brasilia at 1,557 millimetres (61.3 in). The highest recorded temperature was 42.6 °C (108.7 °F) while the lowest recorded temperature was −4 °C (25 °F). 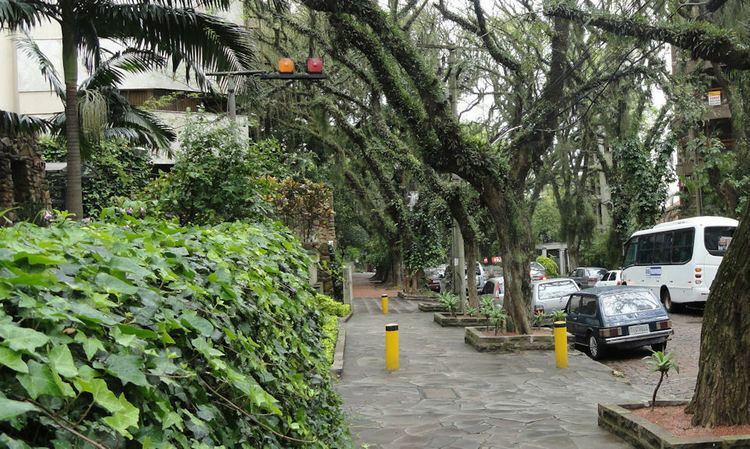 The urban area has many parks and plazas, making Porto Alegre one of the greenest provincial capitals in Brazil. The first city squares date from the second half of the 18th century and were originally large public spaces used as food markets. The city has 39 km2 (9,600 acres) of green space, occupying 31 percent of the city's area. This is an average of 17.6 m² per person. More than one million trees line the public streets and SMAM plants an average of 30,000 seedlings each year. The four main parks are: Parque Farroupilha, a 37-hectare (91-acre) park; Jardim Botânico (The Botanical Garden of Porto Alegre), with some 725 species of vegetation on about 43 hectares (110 acres) of land; and Parque Marinha do Brasil (The Brazilian Navy's Park), a vast park of more than 70 hectares (170 acres) which offers a wide variety of sports fields and tracks. The city's cycleway is called the Caminho dos Parques, which at over 5 km (3 miles) long links the Moinhos do Vento, Farroupilha and Guaíba shore parks. The Lami José Lutzenberger Biological Reserve was established in 1975 in the Lami neighborhood of Porto Alegre, named after the local agronomist and environmentalist José Lutzenberger. It was the first municipal reserve in Brazil. The reserve covers 179 hectares (440 acres). It reopened in April 2002 after being closed for more than ten years to allow its ecosystems to recover. 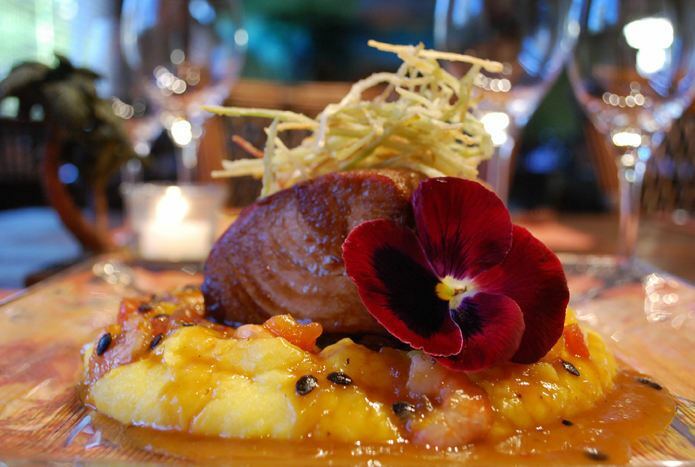 The reserve conserves nature and supports research and environmental education. The Jacuí estuary contains the Jacuí Delta State Park, which in turn contains the Banhados do Delta Biological Reserve, a fully protected area which covers the islands of Pólvora and Pombas. The first non-Portuguese people to settle Rio Grande do Sul were German immigrants. In 1824, the first immigrants from Germany arrived in Porto Alegre, but they were sent to what is now the city of São Leopoldo (28 km (17 mi) away). From 1824 to 1914, 50,000 Germans arrived in Rio Grande do Sul. Most of these colonists had rural communities in the countryside of the State as their first destination. The large rural exodus in Brazil in the early 20th century brought many German-descendants to Porto Alegre and, nowadays, they compose a large percentage of the population. The second largest group of immigrants who arrived in Porto Alegre were the Italians. They started immigrating to Brazil in 1875, mainly from the Northern Italian Veneto region. As the Germans, Italians were also first sent to rural communities, mainly in the Serra Gaúcha region. After some decades, many of them started to migrate to other parts of Rio Grande do Sul, including Porto Alegre. Minority communities of immigrants, such as Central Europeans from Poland and Eastern Europeans from Ukraine and Jews; Arabs from Palestine, Lebanon and Syria; Asians from Japan; as well as Spaniards arriving after the Civil War also made Porto Alegre their home. According to an autosomal DNA genetic study from 2011, the ancestral composition of the population of Porto Alegre is: 77.70% European, 12.70% African and 9.60% Native American. It hosted the first three editions of the World Social Forum in 2001, 2002 and 2003. The third edition attracted 20,763 delegates from 130 countries, with a total audience of 100,000 people from all parts of the world. The participatory budgeting cycle starts in January and runs throughout the year in many assemblies in each of the city's 16 districts, dealing with many areas of interest to urban life. The meetings elect delegates to represent specific neighborhoods. The mayor and staff attend, in order to respond to citizens' concerns. In the following months, delegates meet to review technical project criteria and district needs. Porto Alegre was one of the first cities in Brazil to develop a recycling program and has been acknowledged as having the best management practices in the country. The city produces about 1,600 tonnes of household waste per day. Since 1997, all non-recyclable waste has been disposed of in landfill sites. Infiltration into the soil is prevented by the double-walled construction of a clay layer and a high-density polythene geo-membrane, the lowering of the water table and the draining off and treatment of any effluent. Bars, some with live music, are spread out along, and just off, alongside the Parque Farroupilha and near the Federal University. 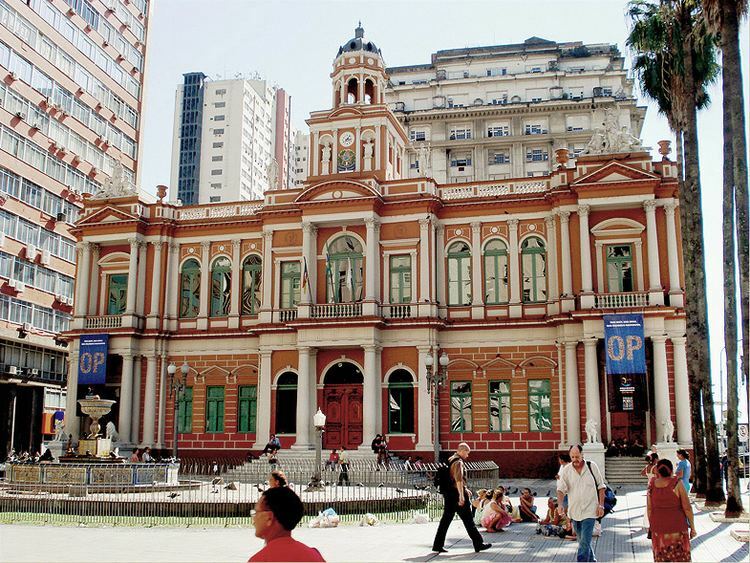 Throughout the year, Porto Alegre's numerous Centros de Tradição Gaúcha organize traditional meals, music and dance performances. In Cidade Baixa (translates as "Downtown") neighborhood, the historical street João Alfredo has many options. Discotheques include Dado Bier, Beco, Opinião and Nega Frida. The corner between Gal Lima e Silva Street and República Street is the center of the neighborhood's nightlife. Cavanhas, Pingüim, Copão, Cotiporã and Panorama are some of the bars. To dance MPB (Brazilian popular music), historical street João Alfredo has many options. In Calçada da Fama, Padre Chagas Street is full of more fashionable bars, like Lilliput and Dado Pub. Goethe Avenue has a concentration of bars (Tri Bar, Arsenal, Dolphin's) and dance clubs. There is also a vibrant more alternative scene with clubs such as Ocidente, Beco, Anexo B and Cucko. 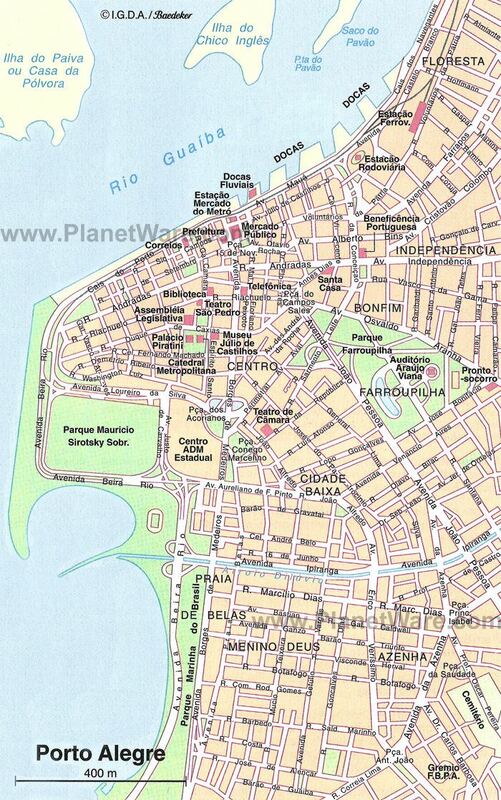 Rua Fernando Gomes has a concentration of pubs, cafes, bars. Avenida Osvaldo Aranha, alongside the Parque Farroupilha and near the Federal University has bars with a predominantly young and trendy clientele. Moinhos de Vento is one of the richest neighborhoods in the city. Its bars and clubs are more likely to be fashionable, including upscale Pink Elephant Club, Faro and Box 21, which feature mostly house music. Along Padre Chagas Street people can find typical Irish pubs and cafes. A fictionalized view of the Porto Alegre nightlife could be seen in the Érico Verissimo's novel Noite.
.]] Educatinal institutions in the area include Universidade Federal do Rio Grande do Sul (a.k.a. UFRGS), Pontifícia Universidade Católica do Rio Grande do Sul (a.k.a. PUC), Universidade do Vale do Rio dos Sinos (a.k.a. Unisinos), Universidade Federal de Ciências da Saúde de Porto Alegre and Centro Universitário Ritter dos Reis. The Port of Porto Alegre is situated in the Eastern margin of Guaíba Lake. The port lying on the eastern bank of the Guaíba lake at the point where its waters empty into the huge Lagoa dos Patos is one of Brazil's largest port. Located near the main access roads to Porto Alegre, is 4 km (2 mi) away from the Salgado Filho International Airport and has access to the railway station, through the docks of Mauá and Navegantes. Its geographical position enables a permanent traffic between Porto Alegre and Buenos Aires, transporting steel-industry products and mainly agricultural produce. Porto Alegre has a rapid transit system operated by Trensurb, which links downtown Porto Alegre to its northern neighborhoods and to cities to the north of the metropolitan area, as Canoas, Esteio, Sapucaia do Sul, São Leopoldo and Novo Hamburgo.The line has stations at strategic spots, such as: the Public Market, the bus station, the airport and many other important and urban spots throughout Porto Alegre and the other cities the metro covers. The line is built at surface level (30 km, totally segregated) and elevated (12 km). Trensurb is operated jointly by the federal government, the state government of Rio Grande do Sul and the city of Porto Alegre through the company Trensurb S.A. (Company of Urban Trains of Porto Alegre S.A.) and has 22 working stations, with a total extension of nearly 43 kilometres (27 mi), carrying about 130,000 users a day. Building of the (sole) Line 1 of the metro started in 1980. The choice of path was made to relieve the heavy traffic of highway BR-116, which already presented serious problems with the transit at the time. The line was inaugurated on March 2, 1985, between the Central Public Market and Sapucaia do Sul. In December 1997, it was extended to Unisinos. An extension of 2.4 miles (3.9 km) São Leopoldo–Museum was added in November 2000, after two months of trial service. As of 2013, an extension to Novo Hamburgo is being completed, with the first station already fully functional. BR-290 highway runs east-west across the state, linking the northeast coast of the state to the Uruguay–Argentina–Brazil border. It runs close to the northern border of the municipality. Coming from west, as it reaches the urban area of Porto Alegre, BR-290 highway becomes a high-standard 100 km (62 mi) long freeway that connects to the coast and to the BR-101 highway. The latter is an important way to get to Porto Alegre from the north of the country, by the city Osório. BR-101 connects to Curitiba, Florianópolis and northern Santa Catarina state, and has been recently upgraded to highway standards, with multiple lanes. By entering the BR-290 freeway/BR-101 system, and the other highways it connects to, it is possible to drive from Porto Alegre to as far as Rio de Janeiro or Belo Horizonte almost entirely through 4-lane (or more) highways. The connection between downtown Porto Alegre and the highways is made by Avenida Presidente Castelo Branco (President Castelo Branco Avenue), which is a short - 4 kilometres (2.5 mi) - avenue also bordering the northwest side of the city, Avenida dos Estados (States' Avenue), which is the access way to the Salgado Filho International Airport, and Avenida Assis Brasil (Assis Brasil Avenue), the main Avenue in the northern Porto Alegre. The average amount of time people spend commuting with public transit in Porto Alegre, for example to and from work, on a weekday is 74 min. 17% of public transit riders, ride for more than 2 hours every day. The average amount of time people wait at a stop or station for public transit is 20 min, while 39% of riders wait for over 20 minutes on average every day. The average distance people usually ride in a single trip with public transit is 7.3 km, while 14.% travel for over 12 km in a single direction. Grêmio Foot-Ball Porto Alegrense plays in the national elite, while Sport Club Internacional is currently playing in the second division. Both have successful histories, having won national and international titles, including the South American top honours, the Copa Libertadores, and the highest global trophy for football clubs, the Intercontinental Cup, respectively its successor, the Club World Cup. 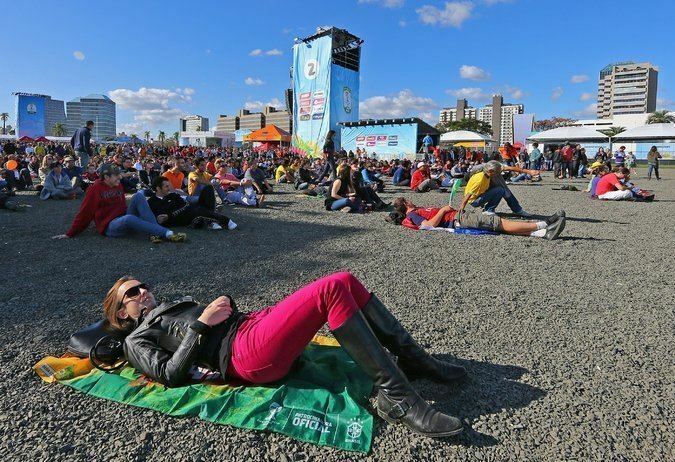 American football is also played in the city, with two teams: Porto Alegre Pumpkins, the oldest in the state, and Porto Alegre Bulls, who play with the Esporte Clube São José, a club with multiple sports.